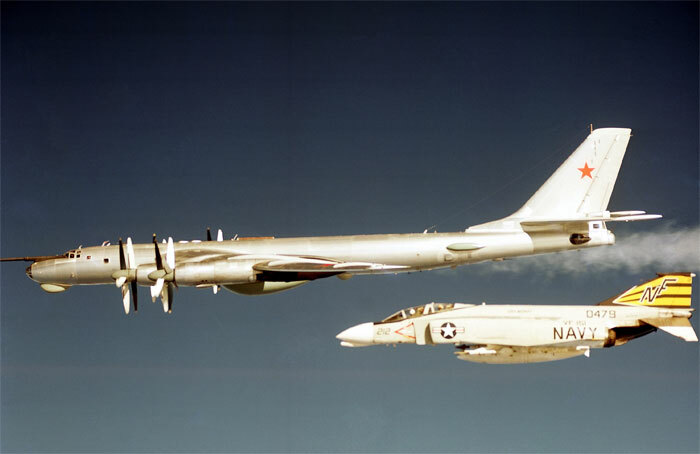 A McDonnellDouglas F-4B Phantom II aircraft (BuNo 150479) from fighter squadron VF-151 Vigilantes intercepts a Soviet Tu-95 Bear-D aircraft in the early 1970s. The Phantom is armed with AIM-9D Sidewinder and AIM-7 Sparrow missiles. VF-151 was part of Attack Carrier Air Wing Five (CVW-5) and stationed aboard the aircraft carrier (CVA-41) USS Midway .